Made with various fabrics including Velvet, Upholstery Fabrics, Brocade and Satins. Inspired by the Mermaids, living tangled in seaweed and sea creatures. HandStitched Label is on the back of the quilt Along with a hanging sleeve to add drama to a bedroom, hallway or living space. The textured fabrics provide a luxurious depth to the pattern. Detail work of applique and free motion stitching satin guarantee this is Truly a one-of-a-kind piece. Measures 53 x 23 inches. "Stars and Stripes" features a cloth used by a close friend in boot camp. 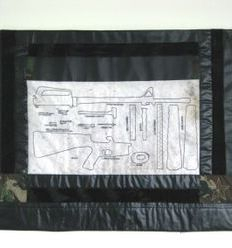 This cloth is how Marines learn to disassemble and reassemble a machine gun, and this knowledge saved his life several times while completing 2 tours in Afghanistan. The theory: Prepare and you won't have to think, just react. But this wall hanging is more than just a cloth, It is an opportunity to say what it means to you. 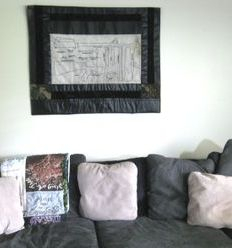 Written in chalk is "Stars and Stripes", the name of this quilt, On the one section of chalkboard vinyl. Erase with a damp cloth to write your own message. Textured Vinyl, Camo, Furry Black, and Bottomweight fabrics are sewn together with Traditional Piecing Methods on an Industrial Consew Machine, Quilted to Hypoallergenic Cotton Batting, then Backed. D Rings are used to hang. The traditional Military Star is free motion stitched onto 2 camouflage blocks at the bottom corners of the quilt. Signed by Knoxville Seamstress, Flea Puckett, on the back and dated, along with the name of the quilt; "Stars and Stripes". Measures 44 x 35 inches. Made with a patchwork of Vintage and newFabric, Trims, and Lace. You will find many fine details All creating this unique One of a kind Skirt. Is heavy and perfect for Fall or winter. Completely washable, though it's best to air-dry. Model is 5 foot 3 inches. Length is 36 inches. Because it is a wrap around Skirt It fits anyone with a waist less than 44 inches. Total waist is 50 inches with 52 inch ties on each side To form a large bow in the back. 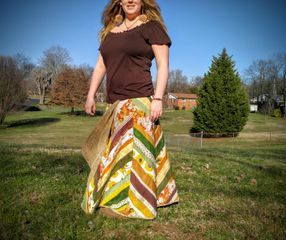 I began making my own skirts After being frustrated with the Quality of skirts I was finding in stores. I know you will be pleased with the Durability of this Skirt. Ever need your slide right in the middle of a song, Ever fumble with your slide? The Slider has come to the rescue! Made so that you can put in your finger to grab the slide And quickly return it to your side. Sewn in metal wire to keep the opening in shape. Metal clip slips right onto your pocket or belt. Measures Approx 3 x 1 3/4 inches. Made for slides approx. 3 inches or taller w/ diameter of 1 1/4 inch. Perfect for taking to a friend's house or to keep sticks close at the gig! Only soft fabrics are used...No zippers to scratch your shells! Each Roll-It-Ups is unique because it is completely handmade. Each Roll-It-Ups measures approximately 24 x 18 inches and holds 8 sets of sticks. PLUS there is a pocket for your drumkey and other accessories, including additional sticks. Use the ties on the side to roll up your Roll-It-Up. 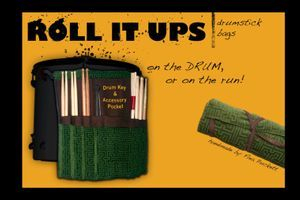 ***This listing is for a Custom Roll It Up Drumstick Bag. Pictures are examples.